Today for #SundaySupper we are bringing you Fall recipes. When I think of fall, two things come to mind, apples and pumpkin. I am pretty excited for today’s recipe because I am sharing with you my first pumpkin recipe of the season, and believe me there will be more. 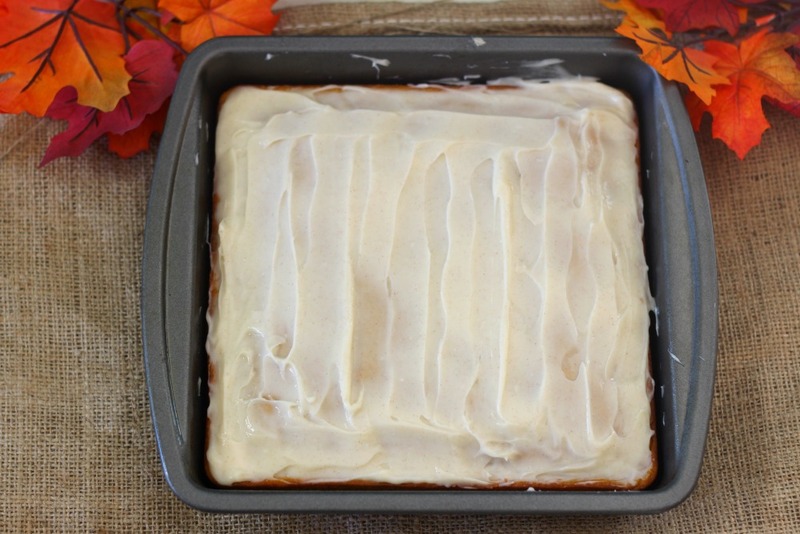 So let’s get the Fall party started with Pumpkin Snack Cake with Cream Cheese Frosting. This cake exceeded my expectations. 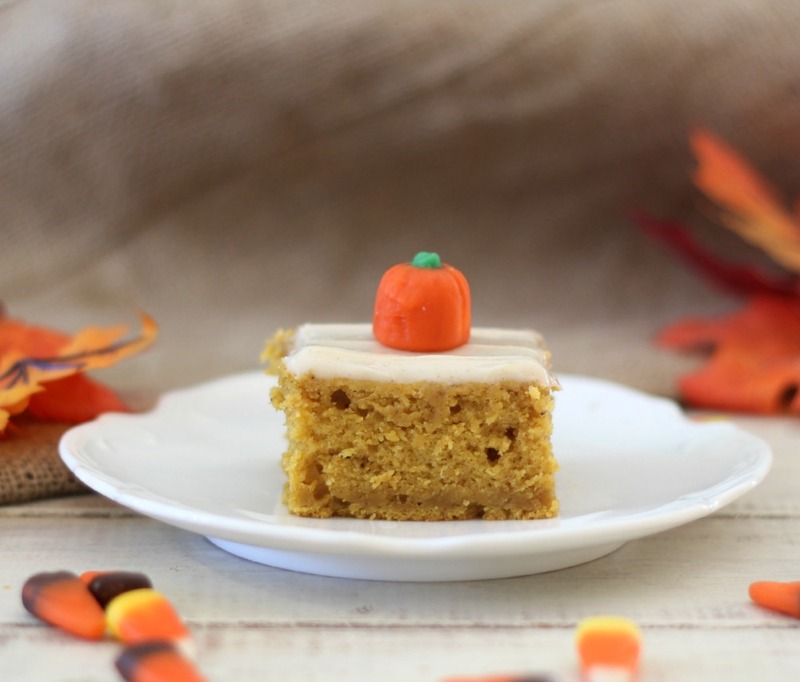 It is so light and moist and has the perfect pumpkin flavor. I gave a slice to Jenny before she headed out to work and her exacts words were OMG! Can I bring some to my boyfriend Jerry? So yes, this recipe is a keeper. The cake is not only tasty, but it is pretty easy to make. I tried to lighten it up by only using a 1/3 cup of sugar in it, but I felt the need to add a pinch of maple syrup at the very end. The maple syrup really brought the flavors all together. For spices, I used my favorites, cinnamon, nutmeg and cloves. You could also use pumpkin pie seasoning if you desire. I was going to leave the cake plain, but at the last-minute I decided to make a lightened up cream cheese frosting. That just took the cake to another level. I went light on the frosting because I feel a little bit goes a long way. It has 2 oz of cream cheese, 1/2 cup of powdered sugar, cinnamon and a pinch of milk. The frosting just makes enough to cover the cake and adds that extra bit of more sweetness. If you didn’t want to frost the cake, it would only be 132 calories a slice. This recipe makes 12 nice size slices. 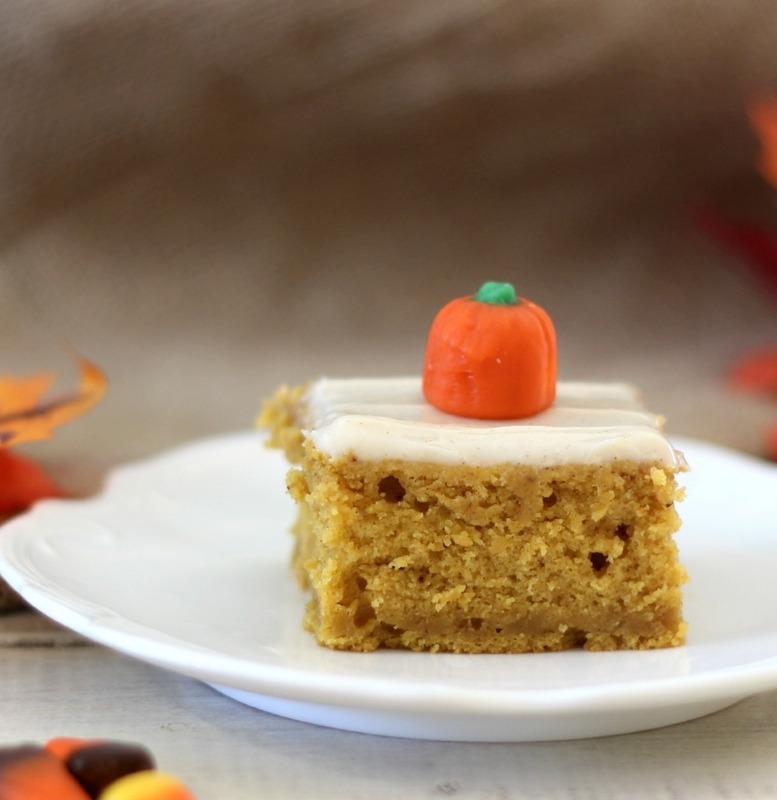 A lightened up, fluffy moist pumpkin flavor cake with a cinnamon spiced cream cheese frosting. Spray a 9-inch square baking dish with cooking spray. In a medium bowl, whisk together the flour, baking powder, and salt; set a side. Using an electric mixer, beat the pumpkin, coconut oil, sugar, vanilla extract, cinnamon, nutmeg and cloves. Beat in the egg until blended. Add the flour mixture in three additions, alternating with the milk, beating after each addition until just combined. Stir in maple syrup. Spread the batter in the bottom of the baking dish. Bake the cake for 20 minutes or until lightly it is golden brown and the center comes out clean with a toothpick. Let the cake cool completely. In a bowl, add cream cheese, powdered sugar, and cinnamon. Beat until lightly fluffy. Add a teaspoon at a time of milk to get the consistency you desire. Spread onto cake and cut cake into 12 slices. Be sure to check out the other fabulous Fall recipes that the #SundaySupper crew is sharing with us today. Kale and Sweet Potato Stew by What Smells So Good? Join the #SundaySupper conversation on twitter on Sunday! We tweet throughout the day and share recipes from all over the world. Our weekly chat starts at 7:00 pm ET. Follow the #SundaySupper hashtag and remember to include it in your tweets to join in the chat. Check out our #SundaySupper Pinterest board for more fabulous recipes and food photos. Would you like to join the Sunday Supper Movement? It’s easy! You can sign up by clicking here: Sunday Supper Movement. Now if that doesn’t get people excited about fall I don’t know what will. It’s a wonderful treat for the season. What a fabulous cake — and love that it’s in a square baking pan. With just two of us in my house, that’s the perfect size!! 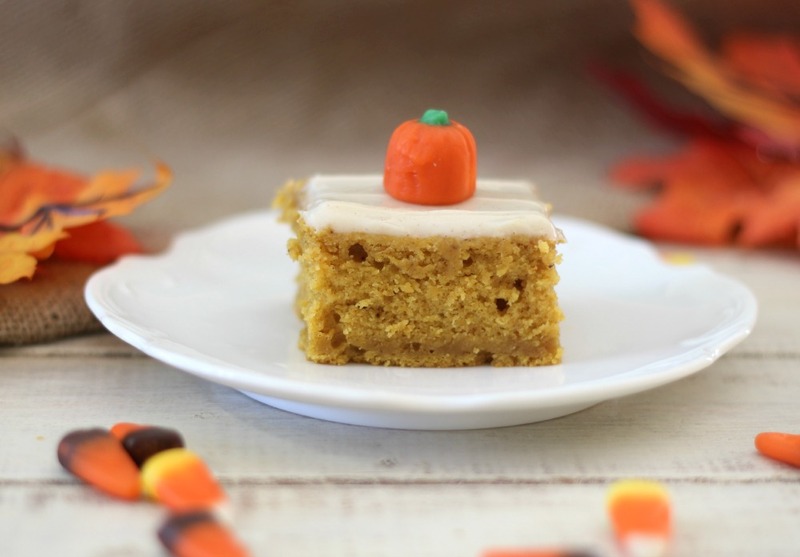 Love the cute little pumpkin candies on top too…adorable! I can’t imagine why I would ever leave off the frosting! 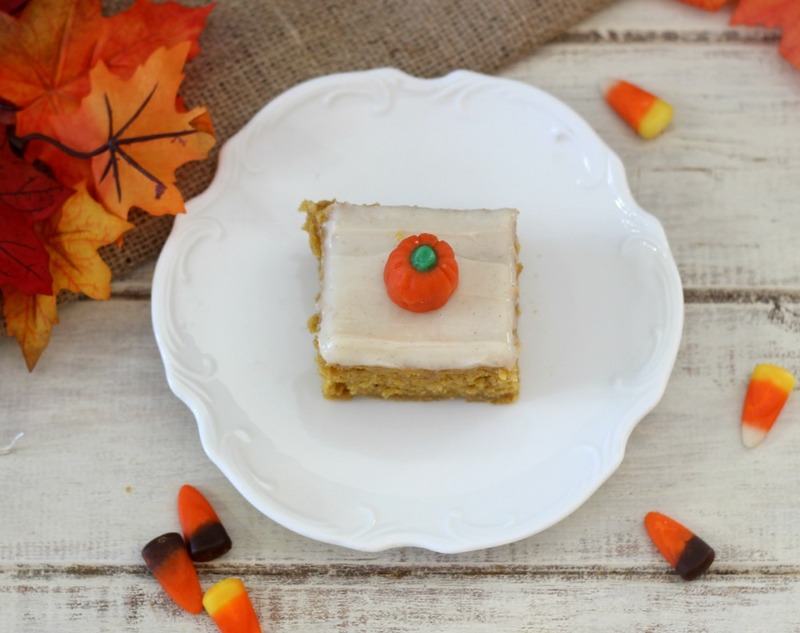 😉 Your Pumpkin Snack Cake looks delicious enough to eat for a snack any time of the day!! Thank you Betsy. Yeah at the end I was thinking, how can you have a cake without frosting? Needless to say I ran out and bought some cream cheese for the frosting. Thank you so much! I just love Fall and I can’t wait to make more pumpkin recipes. This little snack cake is in my future. My NEAR future. It looks right up my alley between the pumpkin and spice cake and my favorite kind of frosting. Pinned!!! Thank you so much Susan! We simply love it and the frosting with a hint of cinnamon is simply delish! I think I could just eat it with a spoon. Oh my, Jennifer. This looks fabulous! Do you ship? Cause I need to have this soon. It looks so moist and delicious! YUM! As much as I love eating pumpkin roll cakes, I’m terrible at making them. This snack cake sounds sooooo much easier to throw together! 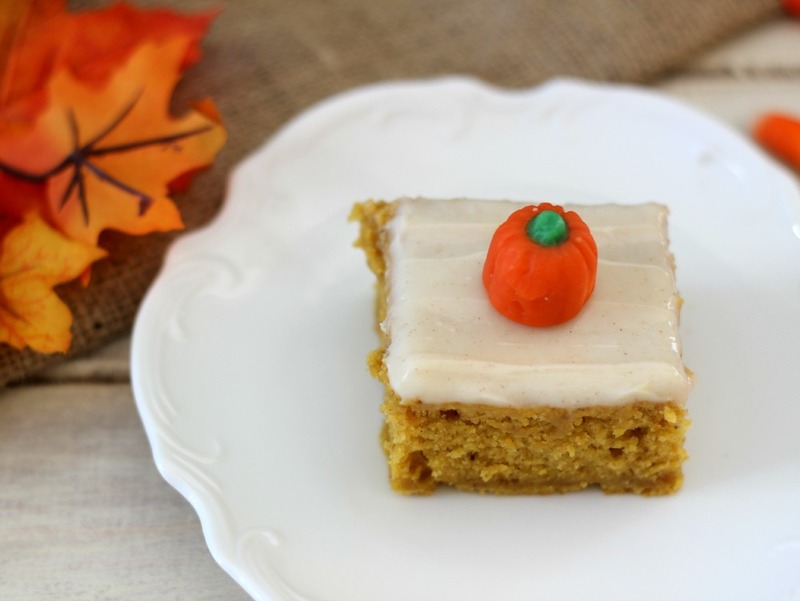 I love making pumpkin bars and adding maple syrup was such a terrific idea! I’m going to have to make a batch VERY soon! This looks fantastic. I love the leeeetle pumpkins! SO cute! I’m ready for this snack!!! Looks like a perfect fall dessert! I love it’s a smaller size too! It’s just 2 of us, so I’m always looking for small sized treats to make!